SpaFetish® Avocado Scrubs exemplify the very essence of sustainable beauty! Since Avocados are packed with Vitamins A, C, D, E, F & K, Biotin, Vitamin B-6, Vitamin B-12, Folate, Lutein, Magnesium, Niacin, Pantothenic Acid, Potassium and Riboflavin, they have a natural affinity for pampering the skin. Plus the oily pulp of the Avocado acts as a shield from environment pollutants. Hence, we have taken due care not to fuss with the innate gifts that Mother Nature has bestowed upon the Avocado. Instead, within each of our Avocado Body Scrubs, we have only added natural essential oils and extracts that compliment the intrinsic order of nature. So, we dare you not to be inspired by the unlikely pairings that are ever present within in each jar of our Avocado Scrub. Because, if we may humbly say so ourselves -- they are the perfect compliment to Mother Nature's majesty and the perfect vessels for well cared for skin. 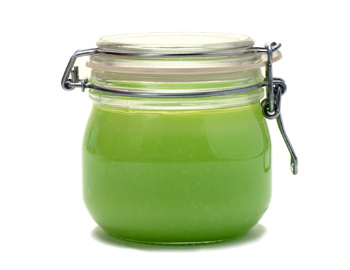 Here, our Avocado Scrub is served unadorned for the greenie who loves to scrub sans any scent. Only the welcome presence of soothing Shea Butter, Vitamins and Dead Sea Salts accompanies the smooth-as-silk Avocado. This unscented body scrub is served in a recyclable 16 oz. jar. A gratis 8 oz. jar of Spa Butter is included. Here, our Avocado Scrub pairs beautifully with the sprightly essential oils of Kaffir Lime. Soothing Shea Butter, Vitamins and Dead Sea Salts makes the scrub complete. This eco-chic body scrub is served in a recyclable 16 oz. jar. A gratis 8 oz. jar of Kaffir Lime Spa Butter is included.